Please join me in Paris. For the Love of Chocolate! If you love French chocolate, we've got you covered. Paris Chocolate Guru officially launched in December 2017 through Paris Airbnb Experiences. 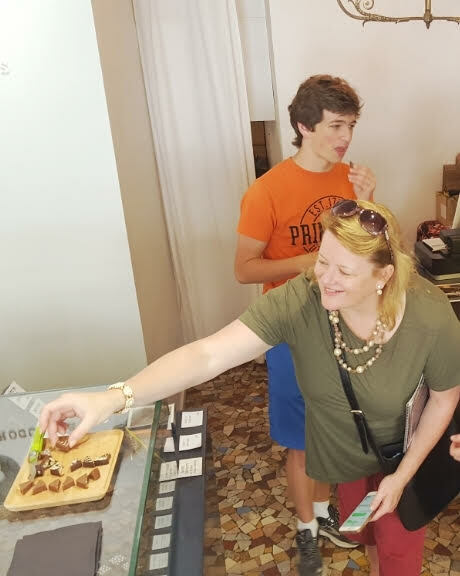 Due to overwhelming success of those initial chocolate guided visits through the Marais, with folks from all around the world, more chocolate-themed walks and experiences were conceived and have recently launched in Paris. If you want to meet happy people while visiting France, you need to go on a Paris chocolate walking tour. I'm not kidding, it must be the endorphin and anti-oxidant rush that single origin dark chocolate is known for. It's a fun way to learn about how the French chocolate makers (chocolatiers) act as caretakers - from the beans to the bars. Chocolate is born on plantations in the cacao belt, i.e. 20 degrees north and south of the equator, into the foodies' art form that French chocolate has become. All Paris Chocolate Guru walks and experiences include at least one visit (and tasting) to a Paris chocolate shop...on one walk, we even go to FIVE shops so choose your Paris chocolate experience carefully. There are 40,000 restaurants in Paris...so if you're only here for a week or two you need to be selective about where you eat right?! The same goes for fine chocolate, in some Paris districts chocolate seems to be everywhere but don't be fooled. In 2011 I started tasting chocolate at over 70 chocolate shops and learned that all French chocolate is not created equal. I hand selected each boutique that gets visited on these Paris chocolate walks over several years. I have researched the most-awarded chocolate chefs and then compared published tasting notes by German chef George Bernadini to what the chocolates tastes like in real life at each boutique. Many of these French chocolate chefs have their own plantations and/or give specific cacao bean fermentation instructions to the farmers they partner with. TIP: The percentage of cacao on a label doesn't mean it'll be a great chocolate. The species of bean and how it was fermented and roasted matters a lot. The terroir of each country that the beans originate from is probably the most critical to giving chocolate complex flavor profiles: the climate, geography, surrounding lushness of vegetation (or not) and soil qualities (e.g. volcanic, peaty, sandy, etc.) should be evident in every bite of single origin chocolate. I'll give you the chocolate vocabulary and tasting method that you need to appreciate fine French chocolate on your trip to Paris. You'll learn some French along the way. It'll be fun! So join me...FOR THE LOVE OF CHOCOLATE!